I was sitting at home the other day when a rare thunderstorm surged over Seattle and lightning bolts cracked out of the sky like Zeus really had it in for us. It was wild and wonderful, one of nature’s best light shows, I thought. Until, that is, a bolt hit somewhere close by. There was an incandescent flare as though a million flashbulbs had gone off at once, followed almost instantly by a boom so loud it shook the house. My heart leaped from its moorings into my throat so I could hardly breathe. “That was close,” said my husband calmly. He believes his main job in the family is to stay calm. That’s because he’s married to a worst-case-scenario person who immediately began to think about how the next bolt might reduce our little house to mere splinters. After I managed to reinstall my heart in its proper place, I began to think about how fortunate we are to have shelter from storms, but also how removed we are from nature. Our culture both shields us and distances us from Planet Earth. It’s good to realize from time to time how overpowering and wild nature really is – and how dependent we are on its bounty. This entry was posted in Uncategorized on August 17, 2015 by constancesidles. Ornithologists are famous for giving common names to birds that are anything but common-sensical. Long-billed and Short-billed Dowitchers, for example, have the same length bills. Ring-necked Ducks have bright rings around their bills, not their necks. Orange-crowned Warblers almost never show their crowns, and when they do, the crowns are almost impossible to see. Common Nighthawks are not common, aren’t very active at night, and aren’t hawks. But Yellow Warblers… ah, that’s another story. 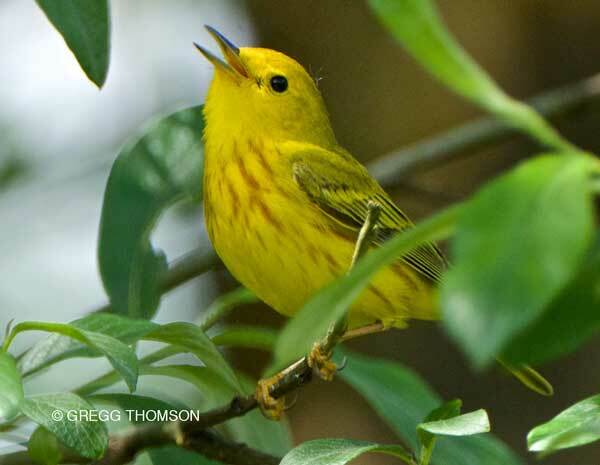 Yellow as the sun, yellow as lemons, Yellow Warblers are a yellow of such pure yellowness they put bananas to shame. As for the warbling part of their names, their contratenor arias are as thrilling to hear as any operatic singer’s. “Sweet, sweet, I’m so sweet,” the males sing in quick time, pushing out their melody so fast they sound like living piccolos. Yellow Warblers arrived last month and can be heard performing on the edges of the wetlands of Montlake Fill right now. throat quivering, bill to the sky. This entry was posted in Uncategorized on June 3, 2015 by constancesidles. while we are free to choose. But we pay a price for that. Today we remember who paid. This entry was posted in Uncategorized on May 25, 2015 by constancesidles. Green-winged Teals have left for parts north and east to breed. They leave quietly in the night, the ducks, hawks, and divers who have spent the winter with us. For them, Seattle is the balmy south. 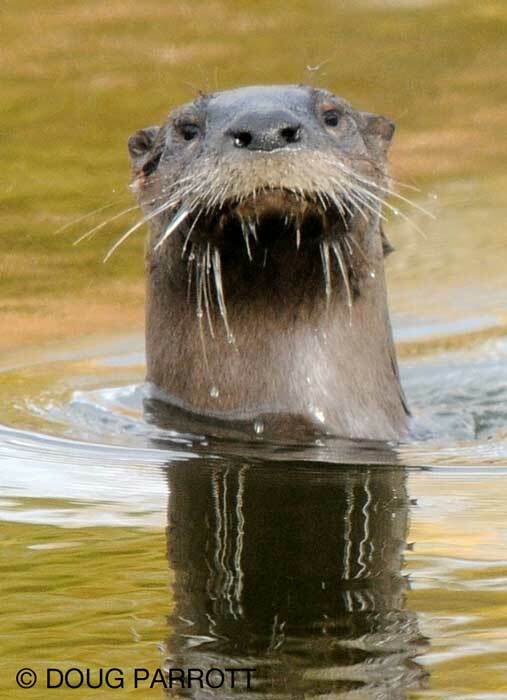 Now that spring has arrived, they are heading north and east to their breeding grounds. Spring is not traditionally a melancholy season, but I miss the teals, buffleheads, and wigeons who have delighted me for so many months. I know I won’t see them again until October, and some will never return, fallen in transit or eaten while defending their nests. On the other hand, I can’t spend much time in mourning, for the spring migrants and summer residents are arriving by the thousands. One of my favorites is the Cinnamon Teal, a glorious assemblage of red, orange, burnt umber, and yellow, a living hotbed of glowing embers in duckly form. Five males were on Main Pond yesterday, trying their best to impress a female, who seemed more interested in eating than in dating. 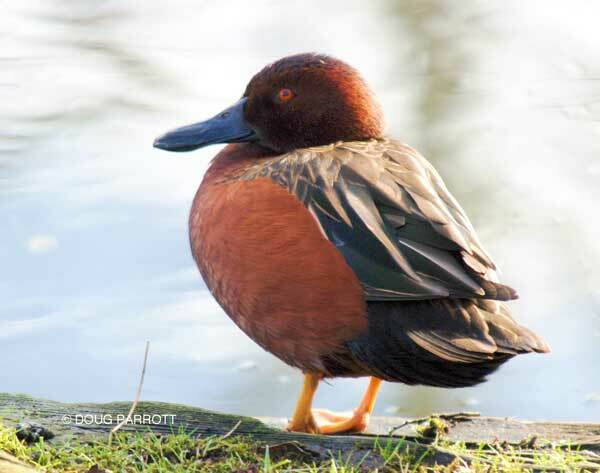 Cinnamon Teals have arrived for the summer. for they bring glory to today. This entry was posted in Uncategorized on May 9, 2015 by constancesidles. Spring in Seattle is wild and wonderful, with wind storms thrashing the trees one minute and zephyr breezes merely tussling the tops of the grass stems the next. Spring is the season when we can almost feel the Earth tilting back toward the Sun, bringing the long days that make us and the birds restless, eager to go somewhere, anywhere. 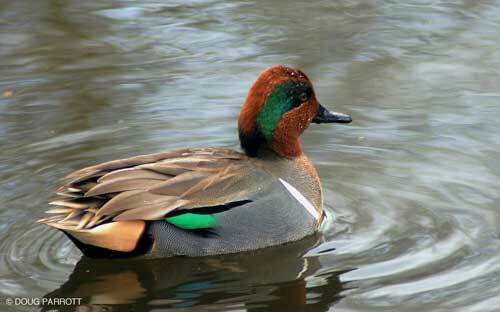 Already the summer ducks are arriving, the Cinnamon Teals in full breeding plumage of burnt umber, glowing like fire. Meanwhile, the winter ducks are gathering in flocks to fly north and east to find that one right, best place to nest. 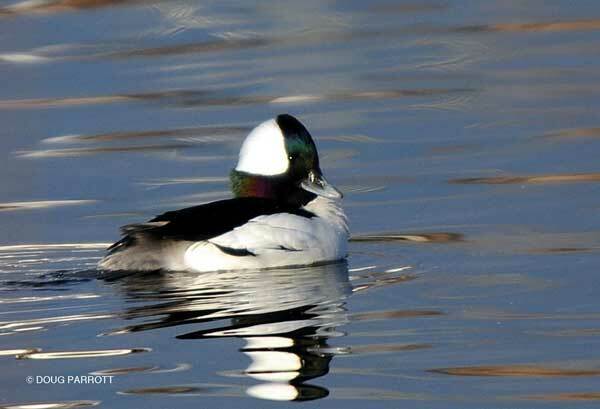 Among the last to wrench themselves away are the Buffleheads, our smallest duck. They will be heading out soon to find lonely ponds in the north surrounded by snags with good holes to nest in. Meanwhile, we can enjoy for just a little longer the males’ jewel tones, decked out in gems from their iridescent heads to their ruby feet. into fire opals, dark and light. This entry was posted in Uncategorized on April 25, 2015 by constancesidles. Dear friends, I wonder if you could help our shorebirds at Montlake Fill (Union Bay Natural Area)? 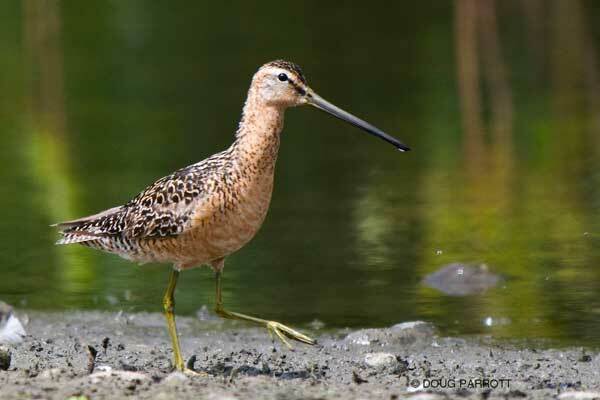 Shorebirds are sandpipers that migrate from Central and South America all the way up to the tundra in Alaska and Canada. Every spring and fall, they pass through Washington. Notably, they come to Montlake Fill to thrill us with their beauty, their hardiness, they *tininess*! Imagine flapping your arms day after day, hour after hour, for thousands of miles to get to Alaska on your own power! That’s what shorebirds do. Long-billed Dowitcher, one of 29 species of shorebirds who visit the Fill. Unfortunately, Montlake Fill has suffered a *catastrophic* decline in shorebird migration. We went from some 1500 birds in the 1990s to a mere 42 individuals last year. That is because woody vegetation has grown all around the mudflats and ponds of the Fill. Shorebirds need open space so they can see their predators coming from far off. They don’t like habitat that has dense cover, where raptors can lurk. Because willows and bushes have invaded the main ponds of the Fill and now nearly blanket the best mud, shorebirds have quit coming. We have a *unique*, once-in-a-lifetime chance to restore shorebirds to Montlake Fill. Washington Dept. of Transportation (WSDOT) is planning to give the University of Washington $2 million to mitigate for the floating bridge they are widening across the Lake Washington (Union Bay is part of Lake Washington). Tragically, though, the mitigation plan they’ve come up with calls for *more* woody vegetation at the Fill. Not only that, the plan calls for so-called “buffer plants” to be planted around all the ponds, making it impossible for students and community members to access them to view any birds at all. These plans will effectively end shorebird migration here. A migration pattern that has existed since the end of the last Ice Age will be no more, at least as far as we will be able to observe in Seattle. Seattle Audubon and I have been trying to persuade WSDOT and the US Army Corps of Engineers (who have jurisdiction here) to alter their plans and *remove* woody vegetation from around the two biggest ponds of the Fill. The conservation scientists at Seattle Audubon believe this will restore a significant population of migrating shorebirds to the Fill. WSDOT and the US Army Corps of Engineers (USACE) refuse to listen. Instead they insist on following a generic mitigation plan that does not take into account the fact that the Fill is a teaching site, where usable shorebird habitat can be accessed by both birds and people. Their plan doesn’t even take into account the fact that our wetlands in the NW differ in nature from those of the eastern US, where these plans were concocted. Indeed, we will end up with woody deciduous wetlands that, according to Professor Dennis Paulson of the Slater Museum (a world expert), will provide habitat for very few birds at all. Finally, we are asking people to spread the word about the petition and our efforts to help shorebirds. Please forward this message to your Facebook friends, your families, and to organizations you belong to. Numbers do count in an effort like this. Will you help? Will you ask everyone you know to join with us? I know your voice(s) would make a difference! This entry was posted in Uncategorized on February 10, 2015 by constancesidles. If you sit on the edge of Yesler Swamp on a foggy, winter’s morning, you might hear a piccolo song floating heavenward from deep in the woods. The song seems to come from all directions at once, until you feel surrounded by music. But the song doesn’t engulf you exactly – it is too fragile for that. It’s more like gossamer wings of sound tickling first one ear, then the other, caressing your cheek, then disappearing back into the mist. You’re welcome to try to find the singer, but I must warn you he prefers to perform out of sight. If you follow his song, he may lure you deeper into the swamp, receding just out of view like a will o’ wisp until you would be lost forever, were it not for the boardwalk leading you safely home again. This is our own Pacific Wren, the quickest singer in all the swamp. His notes come so fast, they sound almost like a continuous trill to us. But if you slow the song down electronically, you can hear how very complex and lyrical it is. Loud, too. 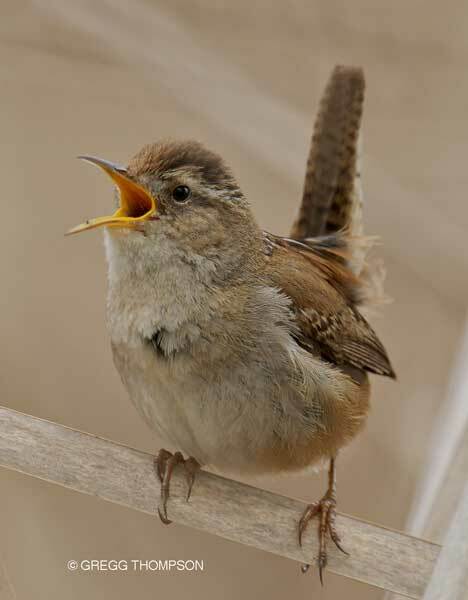 If you were to put a Pacific Wren into a Xerox machine and press “enlarge” to chicken-size, the wren would sing louder than a crowing rooster. Longer-winded, too. 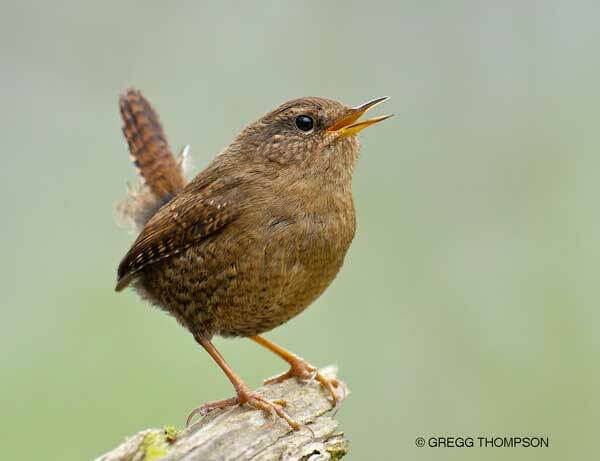 Wrens can sing with both outgoing and incoming breaths, so they don’t have to stop until they’ve sung every last note they want to. This entry was posted in Uncategorized on February 4, 2015 by constancesidles. 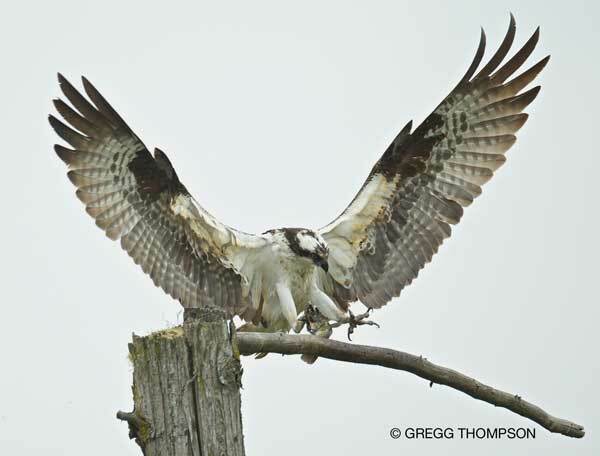 Much as we love our Seahawks team (and hard as we hope they will win this coming Sunday), we in Seattle are privileged to host a real sea hawk: the Osprey. Ospreys come to us from South America, migrating here to eat our fish and raise their young. We have a special pair who nest at NOAA in nearby Magnuson Park and who come to Union Bay on spring and summer mornings to hover over the water as they look for fish. When they see one, they fold their magnificent wings and plunge into the water, talons extended. Look for our Ospreys to return in a few months. In the meantime, we can root for their human counterparts. bright eagle of the sea and sky. you have stolen our hearts away. This entry was posted in Uncategorized on January 26, 2015 by constancesidles. The beavers have been hard at work, as if to fulfill their stereotypical image. They cut down all the birches at East Point and have begun work on a mammoth cottonwood on Boy Scout Pond. What they will do with it when it falls is beyond me. 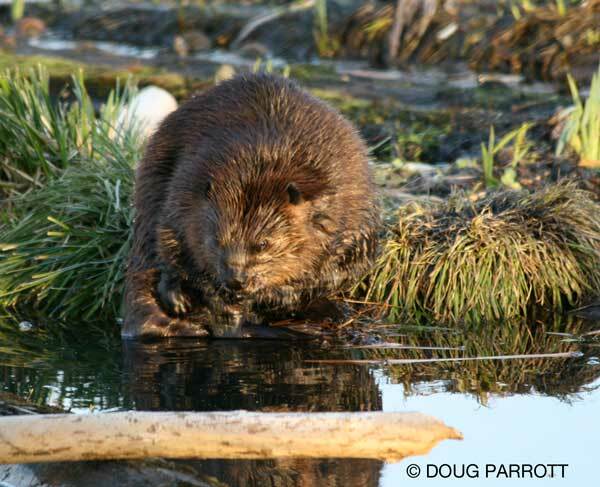 There are seven beaver lodges encircling Union Bay, including one in Yesler Swamp. You can see these large members of the rodent family swimming around the bay if you get out here at dawn or dusk. I once sat my campstool near a mud-slick trail leading out of the water and watched a large North American Beaver swimming toward East Point. He stopped short when he saw me and slapped his tail on the water, which I thought was a warning to other beavers to watch out for the dangerous human in the floppy hat. But instead of diving and escaping, he began to slap harder and harder. At last he was slapping so hard, half his body was coming out of the water with each slap, and I could see his little back feet wiggle. It finally dawned on me that he was trying to tell me to go away so he could climb out and eat the succulent bark nearby. I slunk off. Apparently I am deficient in beaver-speak. 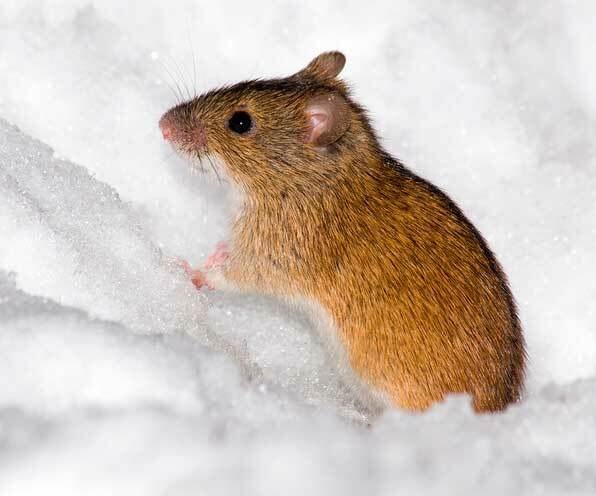 Among my favorite rodents, surprisingly, are the field mice who come out sometimes to feed in the fields. I say “surprisingly” because if I see one in my house, I eek with the best and make haste to stand on a chair. Mickey Mouse was never one of my idols. But wild mice in their natural habitat are cute. More or less. Last time we had a little snow, I found one peeping out at me from a little tunnel it had dug beside the trail. Its nose quivered in the cold as it checked me out, so I wrinkled my nose too and smiled, glad of my muffler and the warm heater I knew was waiting for me back home. and left a wispy trail. This entry was posted in Uncategorized on January 23, 2015 by constancesidles. 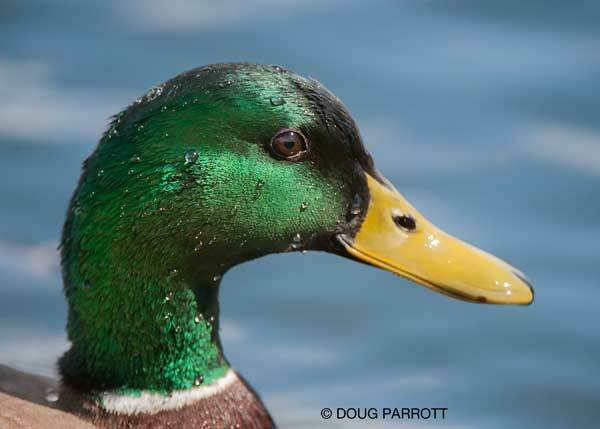 Male puddle ducks such as Mallards face a troubling dilemma every year: On the one hand, they’d like to stay in their nondescript eclipse plumage for as long as possible so they can hide from predators. Unfortunately, they would also like to find a mate before their rivals can snaffle all the most attractive females. The males who get into their spiffy breeding plumage early have the best chance to catch both the feminine and the eagle’s eye. Oy. Our males at Montlake Fill are among nature’s more intrepid gallants and begin to molt into breeding plumage as early as October. Now that January is here, they are all lookin’ good. 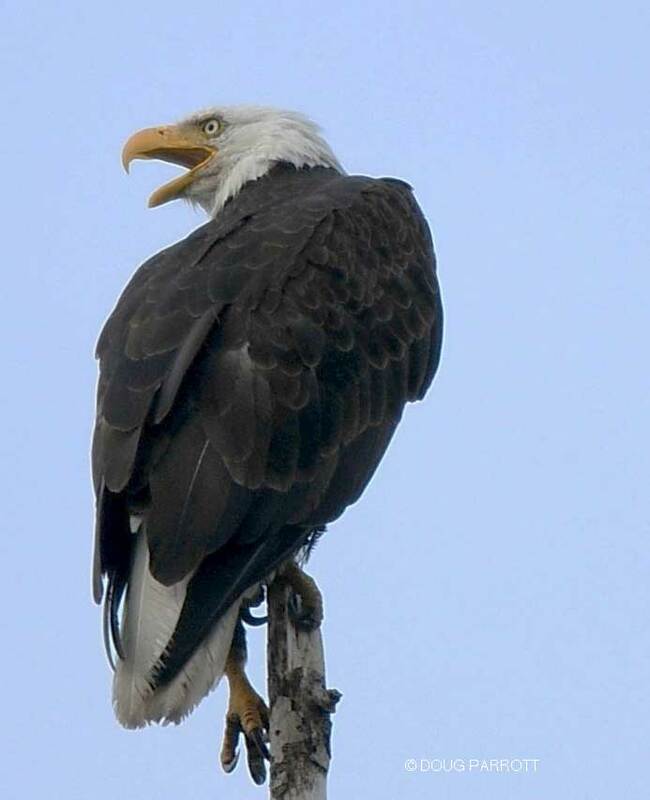 Many have already found their significant other and appear almost insufferably smug—until an eagle shows up and they beat a hasty retreat into the cattails. The remaining bachelors parade themselves in front of the drab females in hopes of getting lucky. It’s a drama you can watch anytime you stroll down to the water’s edge and search for emerald heads set against the backdrop of our silvery lake. There is magic here in winter. This entry was posted in Uncategorized on January 12, 2015 by constancesidles.